What kind of queen will you be? The choice is all yours, but it's a hard choice to make. When you're lucky enough to be royalty, there are a lot of decisions you must face every day, especially if you're storybook royalty. It's a pretty big deal to be queen, but it's even a bigger deal when you're queen over a kingdom in a fairytale or storybook because you usually have to make the big decision. You know, the ultimate decision we were talking about before! You'll have to decide between being a good queen or being an evil queen! Of course, there are plenty of benefits of being evil. You'll always get your way, by any means necessary, but being a good queen comes with lots of love and praise. All the cute, little creatures in your kingdom will idolize you! No matter what you decide, good queen or evil queen, we have the perfect costume for you to wear during your reign. 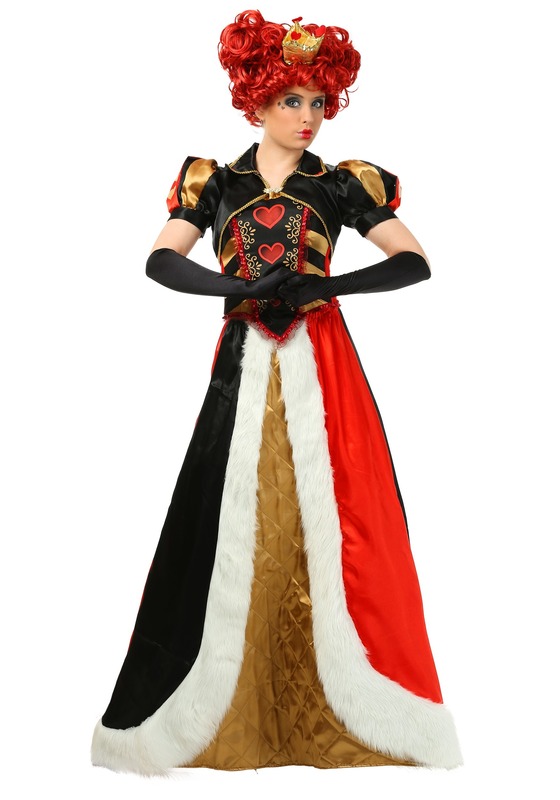 This Elite Queen of Hearts costume is perfect for those who want to look like the classic ruler of Wonderland. Although this costume is considered to be traditional, this floor-length dress is more stylish and modern than most. You'll love the golden accents and the faux fur trim! The puffy capped sleeves, the turned down collar, and the printed red hearts will make this Wonderland themed costume stand out. Pick up the curly red wig and some long gloves to complete this enchanting look. You'll love making your grand entrance to the entire empire, as either a good or evil queen. No matter what you choose, you'll definitely be a fashionable queen! Awesome ! Exactly as pictured, fit well. It was the hit of the neighborhood ! !